It's not for everyone, and teaching your baby to fall asleep on his own can be challenging at first, but some parents find the payoff worth the effort. If getting your baby to sleep is a singing, rocking and jiggling process that's exhausting the whole family, you may want to consider sleep training. "The process involves teaching your baby a new way of going to sleep, usually from being rocked or fed to sleep to falling asleep in her crib," says Jodi Mindell, Ph.D., author of Sleep Deprived No More (Da Capo Press). Experts suggest sleep training when your baby is older than 4 months and is not sick, attempting a major developmental milestone or going through separation anxiety. Training methods differ, but the crucial thing is to pick one and stick to it for at least a week. A review of 52 studies of sleep training methods published in the journal Sleep found that all the techniques were effective when parents were consistent. Most training methods suggest you put your baby down drowsy but awake, then check in with him at regular intervals until he falls asleep. 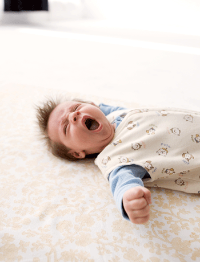 The hardest part, warns sleep coach Jill Spivak, LCSW, co-author of The Sleepeasy Solution (HCI), will be fighting your natural urge to "rescue" and soothe your baby to sleep. "When babies are first learning how to self-soothe, they are frustrated because they don't know how to put themselves to sleep," says Spivak. "Frustration equals crying." She suggests handling crying with verbal reassurance ("Sweetie, go to sleep. We love you. "), but says lingering or touching will cause your child to think he's going to be picked up and prolong crying. The good news? If you're consistent in one method (including for naps and nighttime wake-ups) the duration and intensity of tears should taper off dramatically within a few nights. If you've tried sleep training without success, you may want to call in a pro. A sleep coach will analyze your baby's routine, help you pinpoint what's disrupting sleep, and develop a schedule for naps and bedtime. Look for individuals who are early childhood education professionals with experience in sleep training. Prepare your child's room: Darkness (an 8 or 9 on a scale of 10) and quiet are musts. A fan or white-noise machine is great for blocking household noise. Same time, same place: Keep your nighttime ritual iron-clad and stick to an early bedtime (between 7 p.m. and 8 p.m.) so your baby goes down tired, but not frazzled. Take notes: Record when you checked on your child and how long crying lasted each night and during wake-ups. Tracking progress will help you stay motivated.